VicKing, David Mendez Gurra, jeremyhall2727 and 14 others like this. Glad I will no longer need to be paranoid about cropping my name out of all screenshots I take of the game! And looking forward to some real challenges in prize fights. Hall☆weenQueen, Peacockis2cool4u, Synfull and 1 other person like this. Hall☆weenQueen, Sentient_Spacedust, Yosh and 2 others like this. "THIS is where "hard counter" Fighters will be especially useful. Know you're going up against Armed Forces or Resonant Evil? Bring Peacock Ultraviolent Wulfsbane and/or Silent Kill Wulfsbane! Going up against Princess Pride? Bring a Wulfsbane Wulfsbane and block that healing!" I called it guys she's coming soon I swear. You cant beat D, PHPP, Inked and 6 others like this. Hall☆weenQueen and Sentient_Spacedust like this. Hall☆weenQueen and Daniel117 like this. Sentient_Spacedust, Daniel117 and Renan Flippy like this. Lovely as always. 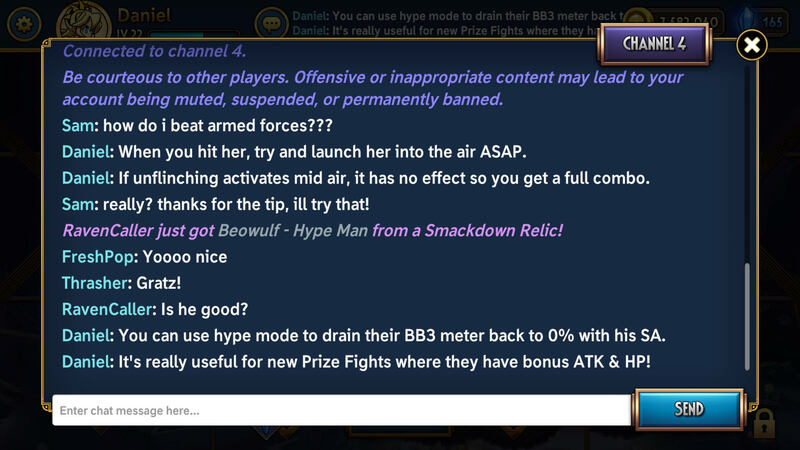 But what cheers me most is the Chat in game. Since in a Facebook group where I am, we usually talk about the console or mobile game (obviously), lately the group has gotten infected of publications of if certain fighter (Example: Parasoul Primed or Big Band G.I. Jazz) is good to improve or level up (and me and a friend have been taking care of them as we can, for the time and the school). Even me and a friend could make a help group in the game for the Spanish language and help and serv Spanish-speaking players in my case. RedRidingHoodie, Sentient_Spacedust and Cartouche‼ like this. moisterrific, Peacockis2cool4u, Renan Flippy and 1 other person like this. Speaking of defense teams, I'm guessing we can choose different teams for each PF? Also, what happens if we could not immediately set our defense team on PF starting? I'm guessing our defense team from previous PF will still be set there. They should improve rewards by raising the user level...... in the next update it would help them to have more players. Totally agree, If I'm not wrong when I was between level 40 to 50, I used to receive 150 crystals, and now I'm between level 50 and 60, I only get 100 crystals, but maybe the milestone rewards improve to compensate (they don't say it but I want to believe there will be changes). 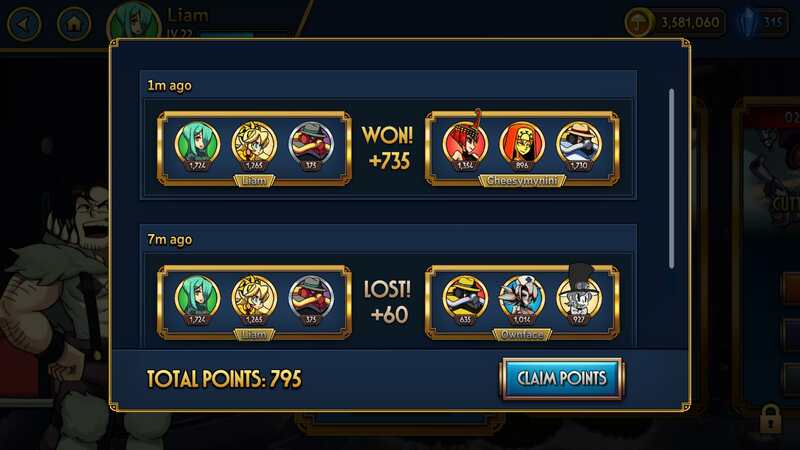 Talking about the update, I don't like the reduction on rewards of daily events but, in general, I really like the idea of improve the prize fights mode (or dynamic), great work, I think the challenge will raise and become this mode even more attractive. And the chat rooms is a great idea too, I hope we can have a room or channel to talk our own languages. Yay major update! I'm super excited for the new changes in pf. A question though. It says "Players now received 25 Theonite on EVERY Player level up." Could anyone tell me how much we used to get per level? Is this an increase or decrease? 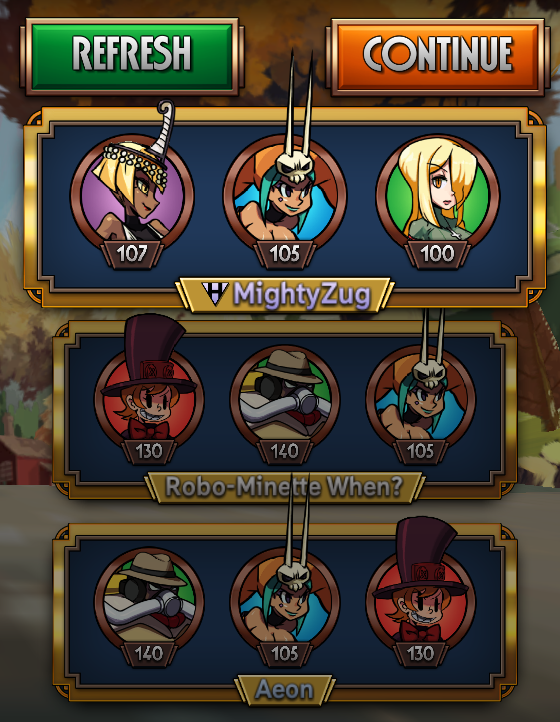 "All daily mission rewards have been reduced by 5 Theonite" Do you mean five in total per day or by each mission, as in 15 per day? I'm a little skeptical about the reduce in Daily Reward theonite. When I was first starting out in the game the daily rewards were the biggest incentive in playing every day. When you're a newbie, getting good in PFs are impossible and dailies honestly don't have enough booties to be very interesting. The first month I played I played mostly for the reward theonites. Is it worth the grind now, I don't know. Hall☆weenQueen, TonyPartridge30 and Peacockis2cool4u like this. Also, what happens if we could not immediately set our defense team on PF starting? And the chat rooms is a great idea too, I hope we can have a room or channel to talk our own languages. i'm so excited for the new update!! 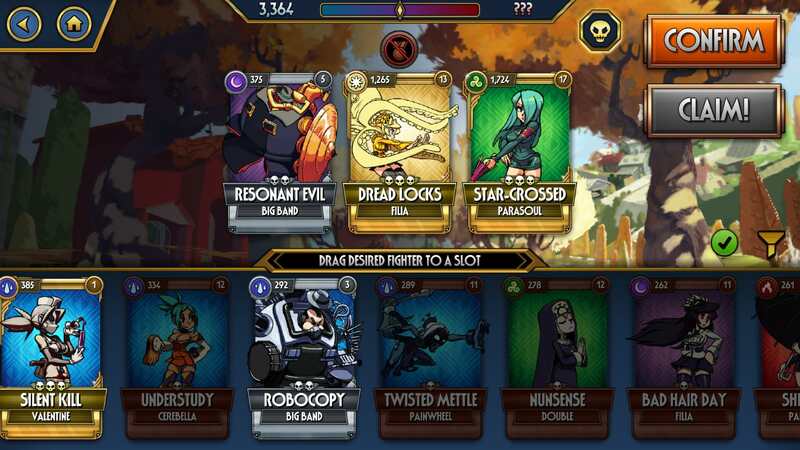 This is all amazing, but when will we get the remaining Skullgirls fighters, which are Squiggly, Ms Fortune and Robo-Fortune?